“The Fall.” It’s not just the title of a Netflix serial killer series, mind you. It’s also a meteorological event that affects millions around the world. So while the Northern Hemisphere of the planet begins to cool off this semester, why not also take a break and ring in a new season with another: the fall television season. These cold autumn nights will be growing longer every day, but there’s no better way to replace the waning daylight than with the glowing screen light of your TV set. Be sure to stay warm and check out some of these new and returning shows that you won’t want to miss this fall. Available from streaming on Amazon on August 31 is “Jack Ryan,” an action thriller series starring John Krasinski (“A Quiet Place”) and the latest adaptation of Tom Clancy’s novel series. Created by former “LOST” showrunner Carlton Cuse, the show will explore the titular character’s origins in a contemporary setting, as he leaves his former desk jockey life behind to eventually become the spy that inspired an entire franchise. Making his return to television, Jim Carrey stars in “Kidding,” Showtime’s new comedy-drama series premiering on Sept. 9 at 10 p.m. Carrey reunites with “Eternal Sunshine of the Spotless Mind” director Michel Gondry for the series’ surreal take on the story of a children’s television show host, who finds his calm Mr. Rogers-esque persona at odds with his sanity as his personal life falls apart around him. Streaming on Sept. 21 is Netflix’s “Maniac,” an American remake of a Norwegian dark comedy series of the same name. 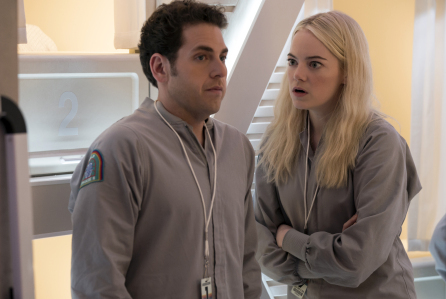 Jonah Hill and Emma Stone star in their first project together since “Superbad” (2007) as two psychologically unsound strangers undergoing an experimental drug trial that allows their joint exploration into each other’s imaginations. Directed by Emmy-winning “True Detective” director Cary Fukunaga, “Maniac” promises incredible visuals for its fittingly insane premise. Returning for its third season on Sept. 27 at 8 p.m. on NBC is “The Good Place.” The high-concept comedy series by “Parks & Recreation” and “Brooklyn Nine-Nine” co-creator Michael Schur follows Kristen Bell as a morally bankrupt woman who realizes she was mistakenly put in a heaven-like afterlife and attempts to study moral philosophy in order to become a person deserving of the afterlife she’s been assigned. There are plot twists around every corner, so avoid spoilers and catch up on the first two seasons, available for streaming on Netflix now and on August 28, respectively. Diving into the fall television season can be a daunting task, but even if you don’t keep any of these shows on your radar, there are still plenty of new shows to discover while the Earth above the equator inescapably transitions into winter.